June has arrived and we have been busy working on the rear lockers and seats. The wood is all cut and waiting for epoxy tomorrow. We got the water system hooked up and working. The sensor pump is fairly quiet and usually runs on the low setting unless more than one connection is opened at a time. I need to remember not to have the dingy next to the shower drain as it really puts out a stream when the sump gets full and the drain pump kicks on. Getting the water in was one of those milestones! The rear lockers will be another. Debbie informs me that the Fridge will be here next Monday. 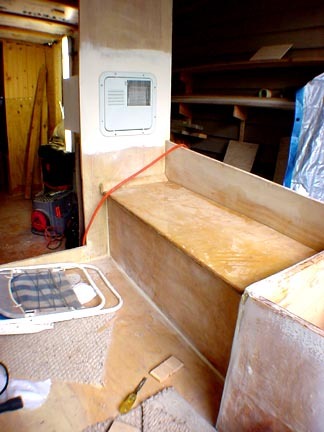 Getting the fridge in will allow us to get going again on the rear cabin. 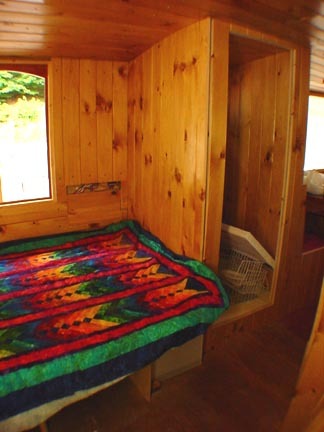 Because we are going with a full time double bed in the aft cabin there will be a jog in the walkway around the bed and knowing how far the fridge will stick out will determine how the bed will be shaped. We are planning on cutting off the corner to give us more clearance. I'll put up a picture when we get it done that will make sense of all this. 6/19/03 We have been busy getting the refridgerator installed. We went with a Norcold DE-441 model. It will draw 3 amps and gives us quite a bit of space plus a freezer compartment. I'm in the process of getting the enclosure fitted with paneling and there will be storage below and a shelf above. I added more insulation to the sides to fill in the space between the bulkhead and also to make it a little eaiser on the battery drain. The rear cockpit seats and locker are glassed and ready to be put together for good. I'm off to the coast for an offshore fishing trip this weekend and the weather has been rain and more rain so time working on the boat has been short lately. 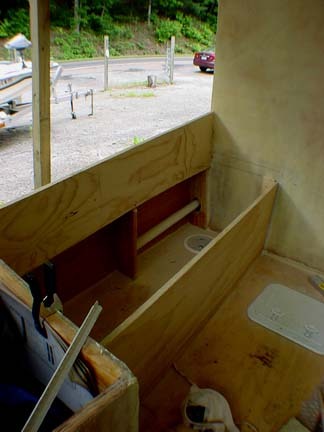 I had an email from Mark Van Abbema (the designer of the Leah Gent) the other day and he is headed to the Carolinas and beyond and is thinking of a road trip up to see the boat. I hope it works out that we can get together. It would be nice to get his opinion about some of our interior modifications and any good ideas he has about other parts of the boat. We have been talking back and forth about a trolling motor/bow thruster in a retractable well idea. We are still in the design stage but I think it would work and still be simple enoungh to be reliable. The fishing trip was a good one. The photo is of my daughter, Jennifer with "Jaws". 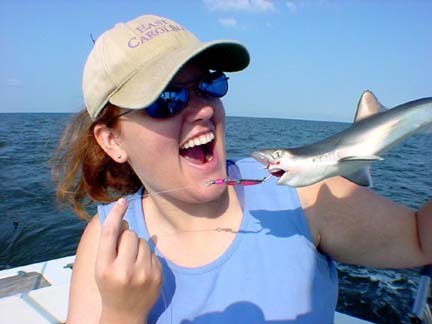 She is a dental hygenist and decided that this shark needed a checkup. We caught a bigger shark than the one pictured but the only photo taken was when I dropped him in the bottom of the boat and had to jump up on the engine box to keep from getting bit. I think we will leave that one on the hard drive for now......... Worked on the cabinet around the fridge last night and got the rest of the paneling for the interior today. It will need to be finished before we get it in this weekend. We made good progress getting the paneling up in the bedroom area. The pictures show the view looking aft and also one looking forward. If you look close you can see all the electrical and plumbing that will be accesible through a small door over the bed. I have valves from all 3 water tanks so I can manage the trim by using the water out any of the 3 tanks or all three at once. 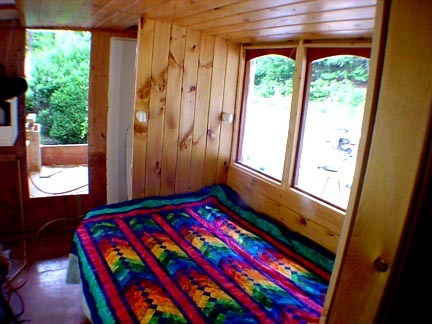 The quilt on the bed is Debbie's effort to make the cabin very colorful. I think it works well. She hopes to have it done when we hit the water. I worked finishing the closet around the water heater and getting in the long counter on the starbard side of the bedroom. It looks like we will pick up a lot of extra storage that we were not expecting and we should end up with not one but two hanging lockers. A real bonus on a boat!! I fired up the fridge yesterday before we came home and returned tonight to find my water bottles frozen and it's not even on the coldest setting. The fridge has a little hum to it but I think it's going to work out real well. It should get quiter when we get all the insulation in place. I'm also going to put a rubber dampener under it to absorb some of the vibration. We have been busy this weekend putting on our daughter's wedding. It was a good time for all and the party afterwards was nice. Did a lot of tours of the boat for our dear friends and family. I've been working on the closet next to the fridge. The front panel was cut out and will be paneled this week. I had to pick up more of the paneling, which means more staining, sanding and 3 coats of urathane. Hopefully this will be enough to finish the cabin. We will have more room than expected with the closet. It will be part hanging locker and part pantry. It's off to Florida this weekend for a final shopping spree at the marine salvage yards and a visit with family and then a week on Carnvial's new ship, The Glory, headed to Costa Maya and Cozemel? Mexico. The rest and relaxation should do us good. It'll be full speed ahead on the "Leah Gent" when we return. 7/19/03 We're back. We had a good cruise on the Carnaval Glory. We were the first passengers on this new ship and oh what a ship. It barely fits in Port Canaveral. Cozamel had the clearest water I have ever seen. Went fishing for Marlin while there. Caught one dolphin in 150' feet of water just off the beach and you could see the bottom. Amazing! I had forgotten how strong the sun is that close to the equator but I should be back to my normal color in a few weeks. We picked up the material for the rub rails while in Florida. I got the idea that starboard would work well due to the fact that it comes in sheets that are 3/4" thick and I can work it with all my woodworking tools and nothing in the world will stick to it. It's a slick plastic material that they make cutting board out of and I was able to find several 8'x6" peices that fit in the Honda for the trip home. We will save a coulple hundred bucks doing the rails this way. We also picked up lots of odds and ends from Ken Gearing at the Flounder Pounder and Marine Surplus Unlimited in Daytona Beach.